The latest release of LinkOptimizer (4.8.11,) is a compatibility update to the popular workflow automation solution for Adobe InDesign. Awarded 4 out of 5 starts by Computer Arts magazine, LinkOptimizer automates complex image manipulation tasks allowing to significantly reduce the size of InDesign links, save processing time and reduce production costs. The new version preserves transparency when converting image formats to TIFF, which is especially helpful for users who need to convert layered Photoshop (PSD) files and resave TIFF images with different compression settings. The update also ensures that the correct image resolution is set for monochrome images on German operating system and addresses some other minor issues. 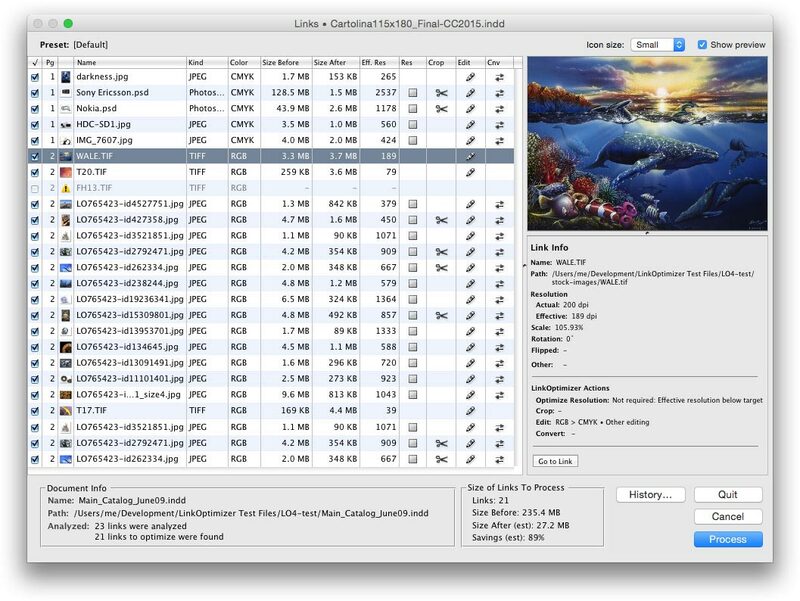 LinkOptimizer makes cutting huge linked images down to size a cinch .... For those wanting to quickly optimize their images and cut down on processing time, LinkOptimizer is a very smart choice. As a result, users can save gigabytes of disk space and countless hours of optimizing images manually, accelerate document output, reduce job turnaround, and cut costs through faster processing. Toronto (ON) Canada - Located in Toronto, Canada, Zevrix Solutions provides automation and productivity solutions for Adobe Creative Suite software, PDF and graphic file diagnostics and Microsoft Office on Mac OS. Zevrix is dedicated to help professionals increase their profits through automating everyday tasks, producing error-free documents, saving disk space and cutting production costs. For more information, visit their website. Copyright (C) 2013 Zevrix Solutions. All Rights Reserved.